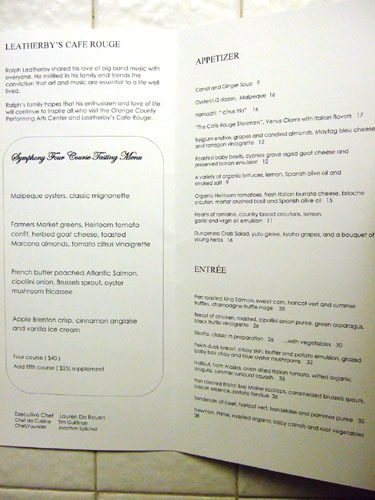 Given my impending visit to this restaurant next week I thought it might be nice to repost my first tasting menu experience. I hope the kitchen has achieved a level of consistency since our last visit. Restaurant empires tend to get a reputation as sellouts, more concerned with profits than the pure essence of cooking. I have to say whatever the Patina Group is doing they have found the perfect compromise. This is the third of their restaurants I have tried, the first two being Catal and the flagship Patina and I have enjoyed all three. This is actually my second time dining at Leatherby's Cafe Rouge and I have to say it lived up to my expectations far more than my first visit. My friend and I had a late dinner at Leatherby's after a long evening of shopping at Bloomingdales. It was quite the successful man-date. We showed up to a nearly empty restaurant, a nice change of pace from the crowded noisy restaurants we are accustomed to. With so few diners, it seemed every member of the staff came by to perform one function or another. 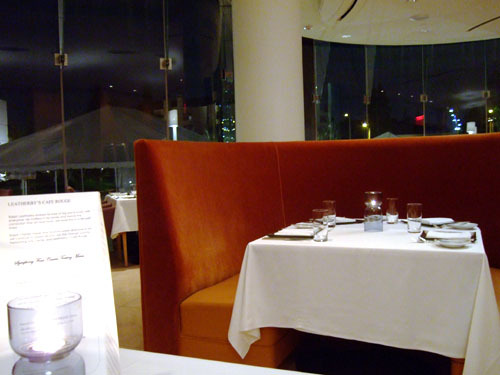 When we sat down, we immediately decided on the tasting menu. 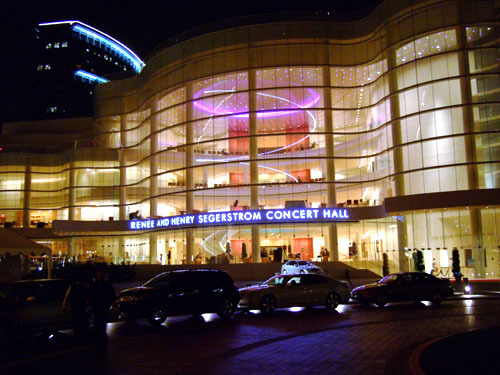 Oddly the tasting menu had changed drastically from a genuine gourmet tasting menu to a speedy pre-theater dinner (logical given the restaurant's location in the Segerstrom Concert Hall). 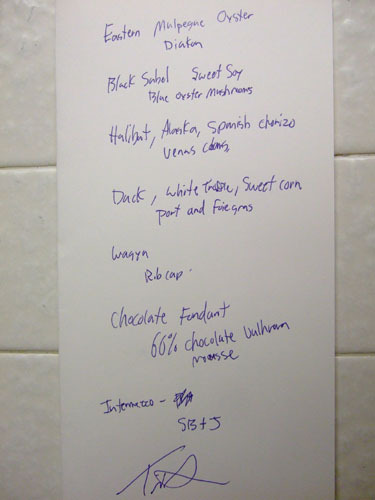 Since we came so late the staff asked if we would like a more complete tasting menu than, much to our delight, proceeded to whip up a totally different menu for us. 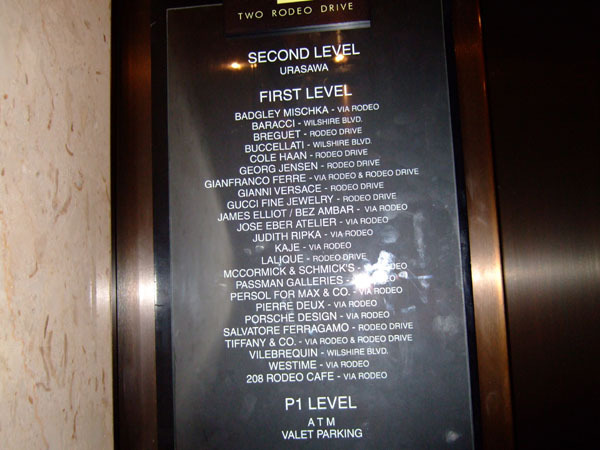 Although this may have also been due to the fact they had a very busy pre-theater and were out of many of the ingredients for the printed tasting menu. Naturally, a fine menu deserves a good wine pairing. Given the spontenaiety of the menu, there was no time to write up a formal wine pairing and we did not get the precise list. 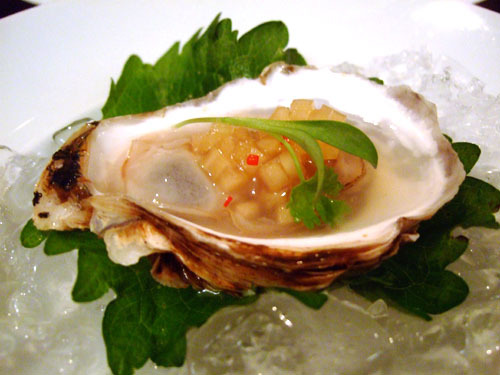 The amuse was a single oyster topped with a light daikon mignonette. 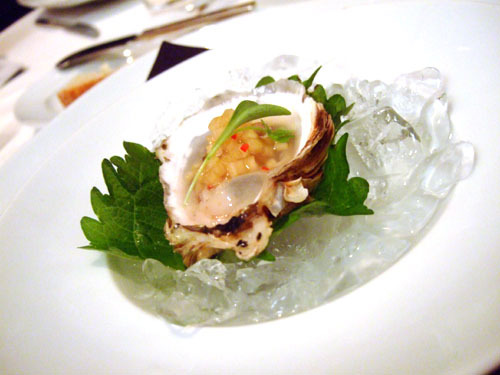 The oyster was a significant departure from the norm, with a much lighter briney flavor. Very light and refreshing, a pleasant treat to start the late night. The wine paired with this was a daiginjo sake which was very floral and sweet initially but became a bit harsher after the oyster. 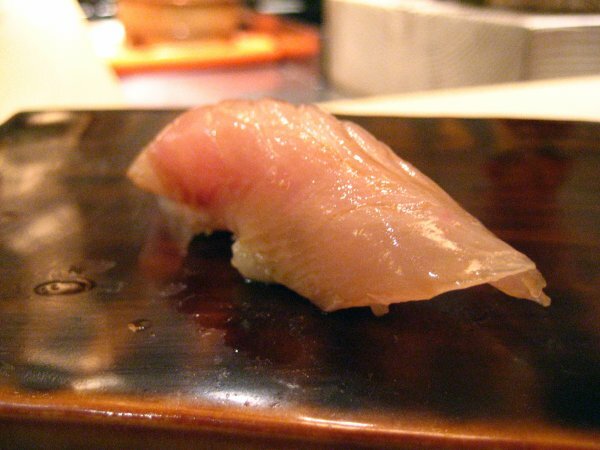 A nice tender piece of fish, perfectly cooked with tender yet firm flesh that flakes when pressure is applied. 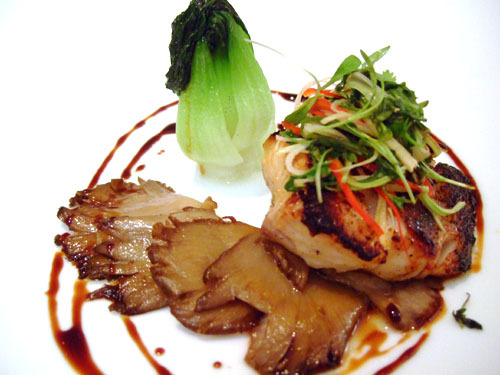 The fish was cooked in a very Asian style with sweet soy and a topping of julienned ginger and onion. The chef later told us this fish is often misnamed butterfish or black cod making me thing the famous black cod with miso is actually black sable. This fish was also paired with the sake, a sensible choice given the Asian flavor, unfortunately I again found the wine harsher and less palatable after the food. 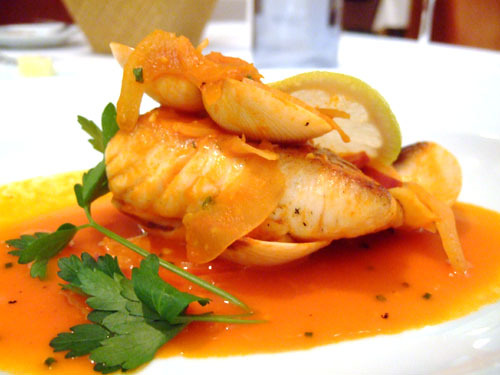 An interesting choice the chef made halibut, spanish style with a tomato and pepper sauce. Halibut is always one of those fishes that worry me, sometimes perfectly soft and beautifully done, other times dry and stringy. Luckily, this happened to be one of the former. I tend to shy away from Spanish preparations but this was quite good. 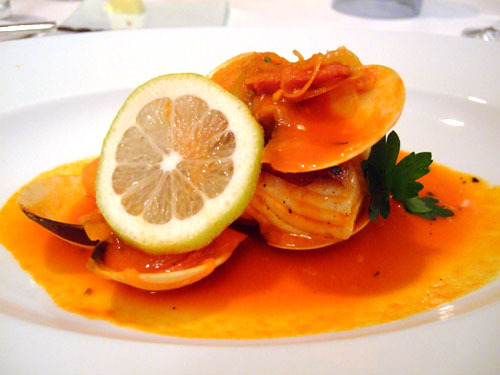 The chorizo wasn't overpowering and the clams were very clean and firm, although I did get a bite of shell once. The wine paired with this was an Italian white, that was fruity on the nose but very nice and dry on the palette. The chef later explained halibut is a difficult fish to keep for extended periods because the natural juices tend to flow out very quickly. He actually feared the pieces he sent us might be overly dry but was surprised to learn that was not the case. I mentioned the horrific experience my girlfriend had and he apologized but rationalized it saying sometimes the demands of business compromise the purity of the cooking. The most fun course I have had in a while. 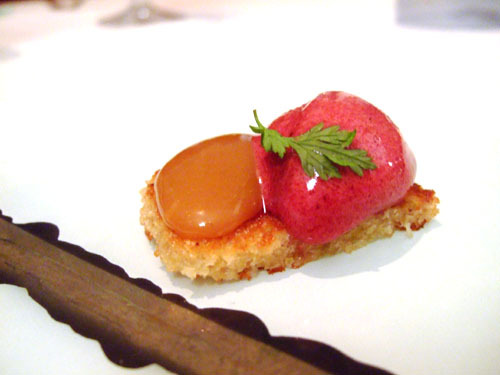 Basically a super-upscale peanut butter and jelly sandwich to serve as a pre-dessert between the fish and meat courses. The restaurant got a shipment of fresh Kyoho grapes the didn't know what to do with so they made a sorbet. Tahini is actually sesame paste but can double as a very respectable peanut butter substitute in a pinch. Maybe if my parents made PB&J like this when I was a kid I would have actually liked it. Another very nice duck. 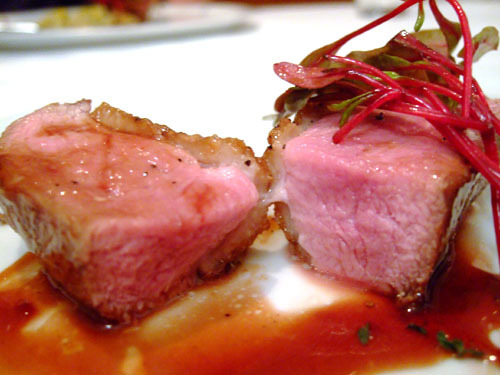 Succulent and moist with nicely cooked crispy skin all slightly covered in a thin coat of melted duck fat. 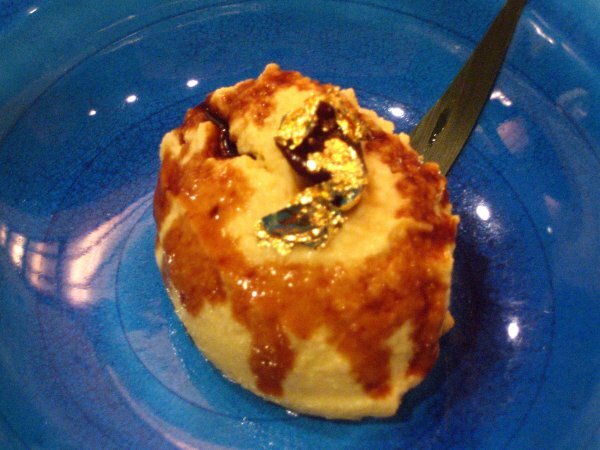 Add to this fresh sweet corn flavored with the etherealness of truffles and a sweet savory sauce. 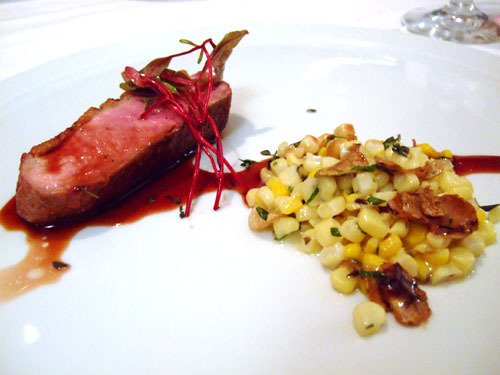 The duck came topped with some intensely tart beet leaves which I later learned were covered in a pomegranate reduction. 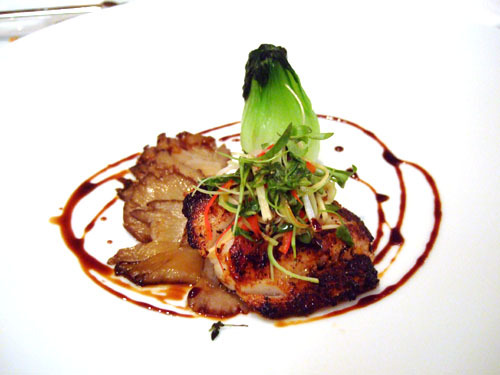 The leaves were added as an afterthought by the staff and the chef seemed genuinely surprised we enjoyed it. Probably my favorite course of the night. As one might expect a pinot was paired with the duck. Not quite as good as the perception altering pinot at Patina but still a very nice glass. 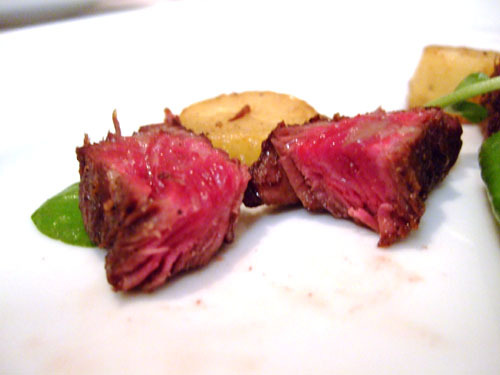 We naturally added the Kobe beef to our tasting menu. When we asked if the Kobe was real or from Snake River Farms the chef promptly answered Snake River. I am happy to report this may be one of my most positive experiences with American Kobe. The meat was not super fatty but it was super tender and cooked very well. The meat did not come marred by any sauce and the sides were served with minimal additions as well. To wash the meat down, the sommelier paired a classic cabernet, very nice if a bit on the more restrained earthy side for my tastes. A nice dessert if nothing particularly special. Fondant is basically a fancy word for icing. Before you get the wrong idea, the fondant is not simply icing it is actually a dessert akin to solidified chocolate cream similar to what you find in a truffle. The port paired with this was quite spicy and not sweet at all decent on its own. Sadly it wasn't sweet enough to overcome the flavor of the dessert and tasted powerfully bitter afterwards. The meal ended with a very brief tour of the kitchen, since it was almost 1AM and everybody probably wanted to go home. The kitchen was quite small given the size of the restaurant. By the time we took a peek inside the kitchen was shut down except for the dishwashers which gave the small space an unbearably hot and humid feel, definitely not a nice feeling after a good meal. Unfortunately there is no picture of the chef. He came out to talk to us twice. The first time was at the start of the meal and he was incredibly brief almost to the point of rudeness, but we put this down to his desire to cook and get us out as soon as possible. The second time he came out after the duck and was far more personable. He gave us an image of a restaurant in flux. The chef had changed somewhat recently and I get the impression the restaurant was not living up to expectations. I can see my first experience is a result of that. Coming on a day when the theater is closed, the restaurant cannot manage much business and is consequently forced to lower their standards. He also explained the restaurant experiments with their post-theater service to find out what works and what doesn't. Again this gives me the impression of a restaurant that has not found its identity. Leatherby's has been around for almost a year, and they considered the first year a sort of trial run. Given I had two very different experiences so close to one another there are clearly some issues that need to be worked out. Lets hope their new chef gets the chance to bring some stability and consistency to the place. 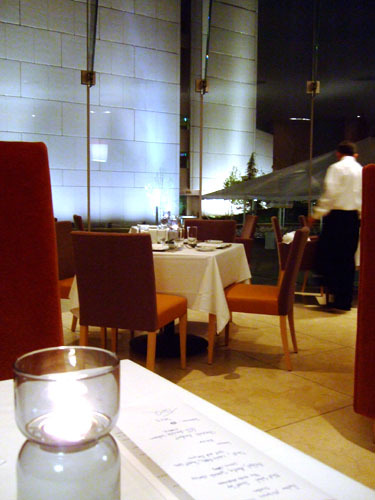 This last time at Leatherby's was my best dining experience out of the three Patina Group restaurants I have been to and that is including the flagship restaurant, Patina. I honestly believe Leatherby's has the potential to be a top restaurant in Orange County. Although I feel they need to sacrifice profitability in the short term to build up a customer base. Being located in a theater, potential clients will definitely be fairly well off. By establishing themselves as a first-rate restaurant they can build the clientele to run a successful business without sacrificing quality. To that end I recommend all foodies in the area give Leatherby's a try, preferably after the pre-theater crowd has cleared out all the leftover stock. Special thanks to Kevin for providing the pictures. With an impending second visit looming at the end of May, I decided to repost the review that launched my food reviewing career. This meal has been something my friends and I have discussed for years, ever since the place was called Ginza Sushi-Ko and run by Chef Masa Takayama. Masa has since moved on to New York, opening Masa and Bar Masa in the Time Warner Building across from Thomas Keller's Per Se. 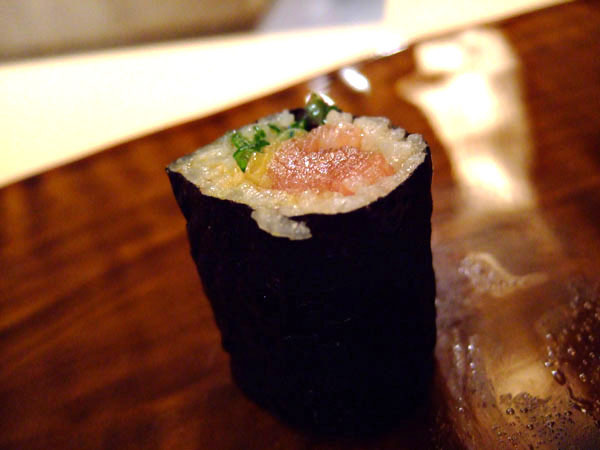 Fortunately, for West Coast sushi lovers, Masa's student Hiro Urasawa has stepped in and taken the restaurant vacated by his former sensei. 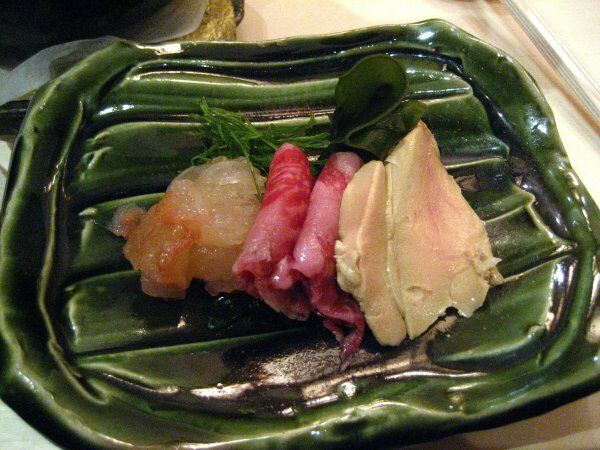 Urasawa serves what is known as sushi kaiseki. Kaiseki is a type of Japanese meal consisting of numerous small courses; it originates from the light meal served in a Japanese tea ceremony. 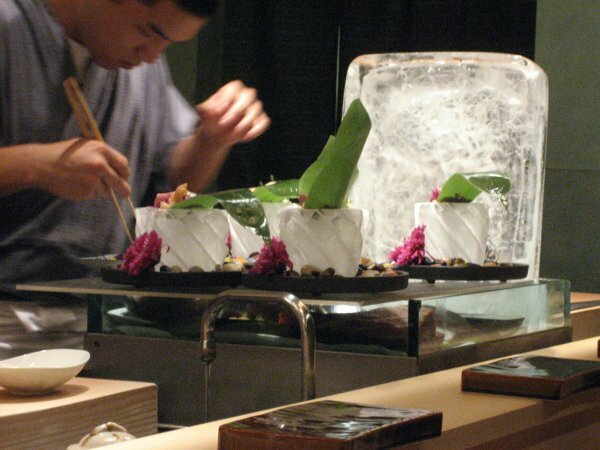 These courses are followed up with individual pieces of sushi. 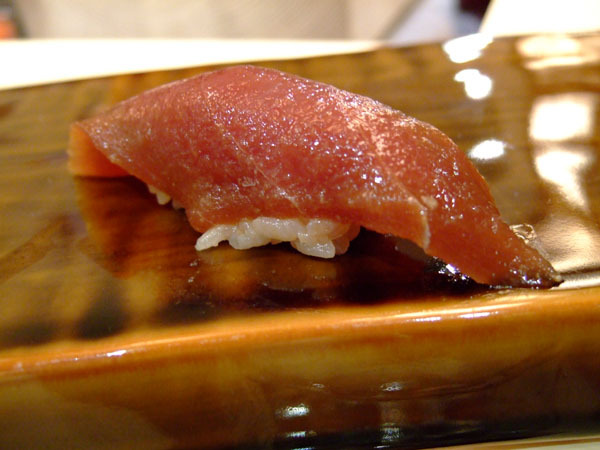 Keep in mind this is not Americanized sushi (no California rolls here) nor is it even your local sushi restaurant. 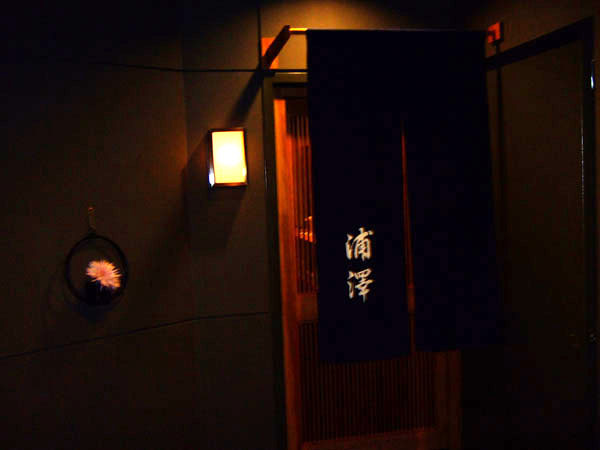 When you come to Urasawa, you put your trust in the hands of Urasawa-san, the only menu you get is a drink menu and even that is limited to a few choice selections. 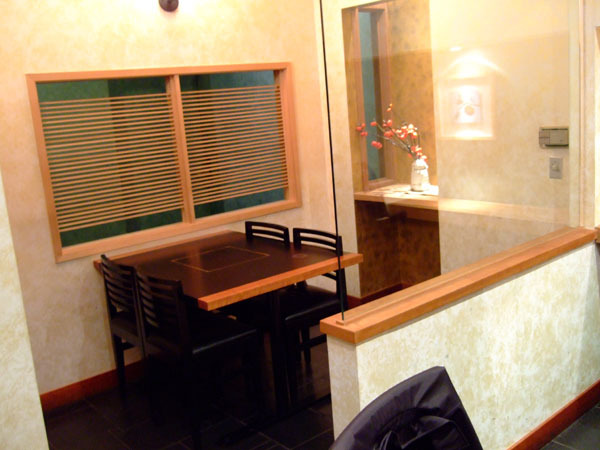 The restaurant is located in an unlabeled building. To enter take Wilshire and turn onto North Rodeo then make an immediate right onto Dayton way. There nestled in this nondescript street is an equally nondescript building with an underground parking garage. Despite the bland looks check out the directory and you will see Urasawa in good company. There nestled among endless identical hallways sits this darkened corner that stands out from the rest. 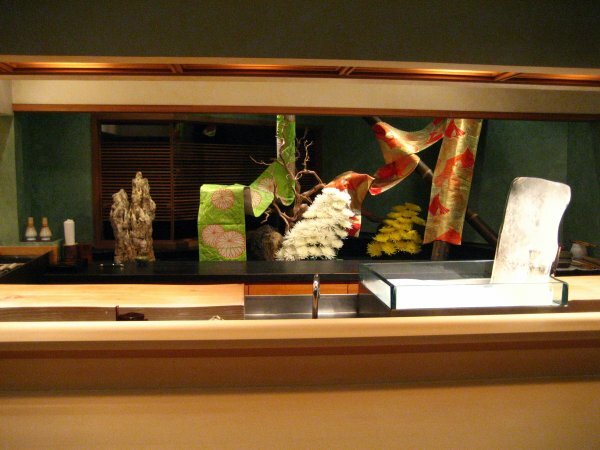 Behind the curtained alcove lies the Mecca of sushi on the West Coast. Upon entering one is greeted by a simple yet polished dining area, a well lit bar with functional chairs and neatly folded place settings, the chef's work area where all the magic happens with a case of fish fresh from the market, a curtained kitchen area where unnamed servers do much of the prep work, a shelf running parallel to the bar where drinks are stored, and a table for those seeking a more private dining experience. 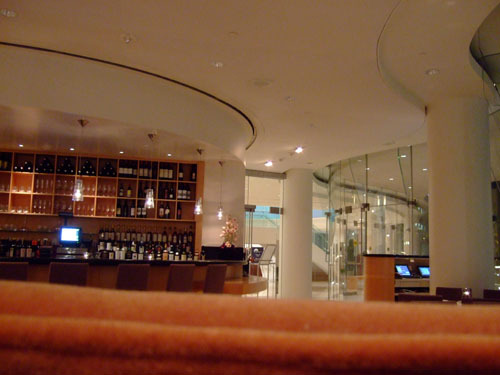 The wood of the bar area is sanded daily and the feel reflects that loving attention. As soon as the hostess offered, I promptly took a corner seat at the bar ignoring a companion's inquisitive glance at the lone table to the side of the room. 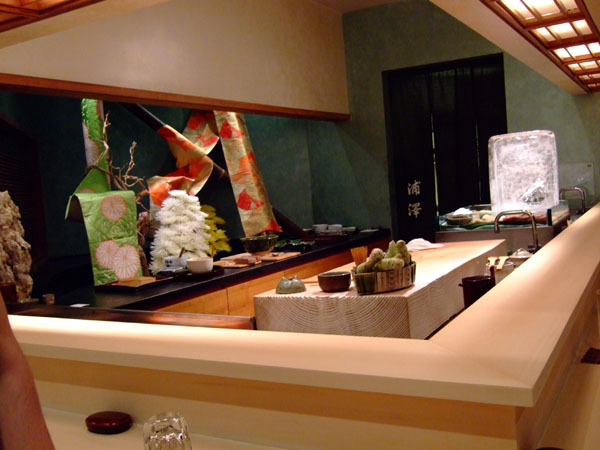 If you've come to Urasawa it is as much to admire the artistry of the chef, as it is to sample the transcendent results. 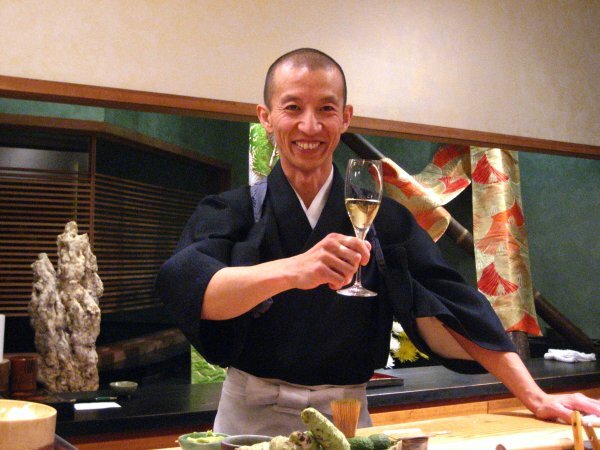 Not to mention Chef Urasawa is an affable host who engaged us in conversation throughout our meal. I noticed he focused mainly on speaking to us and while I'd like to think this was a result of personal charisma I'd wager it has more to do with proximity to his work area. Prior to the start of our meal Urasawa-san asked us a few simple questions. If there was anything we did not like or if there was anything we were allergic to. He also asked if we were Chinese or Japanese and was a touch surprised to find we were Chinese even going so far as to note that I look like his younger brother. He also took down our names; I believe this is to keep track of who we are and what we have eaten so that next time we return he can create a different masterpiece for us. There were two other parties dining at Urasawa that night, a group of Cantonese people who I gathered were regulars and a group of tourists from Australia. Now normally I would take it as a bad sign if there are no Japanese people were at a sushi restaurant, however Urasawa cannot be judged by such stereotypical standards. After we finished the pleasantries we ordered the first round of drinks. Having done a bit of homework before coming I was set on trying the Kubota Manju, but was saddened to hear they had run out. Fortunately they did have some of the smaller flasks so we promptly ordered two. 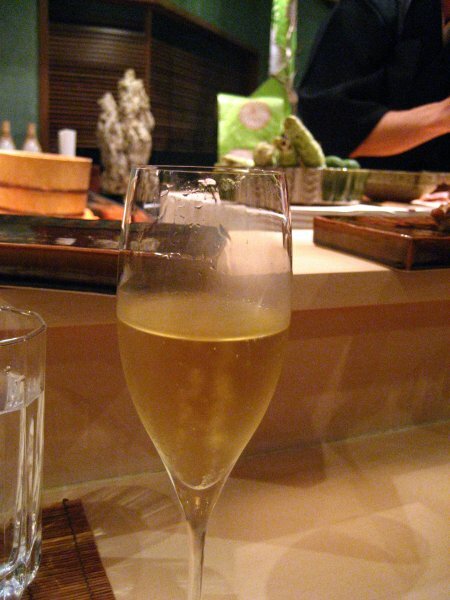 The sake was clean, crisp and refreshing with only a whisper of alcohol. Surprisingly it lacked the slightly sweet flavor I have noticed at subsequent tastings. 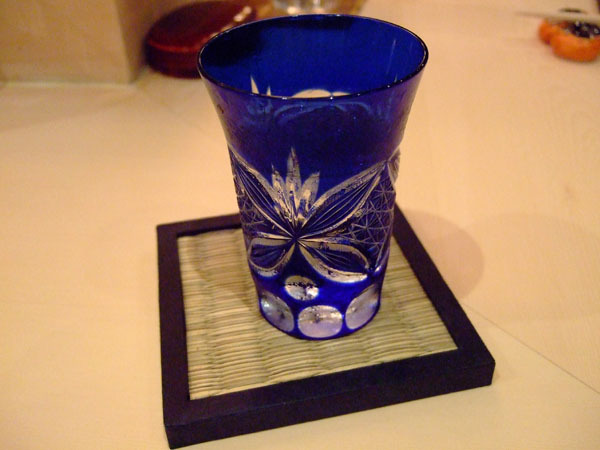 We had a second sake midway through the kaiseki part of our meal. This was a bit sweeter but the flavor seemed to give way to an astringent herbal flavor I wasn't so fond of. Now then onto the reason we were there and you are here, the food. My worry with radish in general is that its earthy flavor will overpower whatever it is paired with. The first bite this wasn’t the case as I received a pleasant mouthful of oil and cooked fish with a bit of citrus zest and the sweetness of the onion. The second bite sadly the radish came to the fore and overpowered the fish a bit. This dish had a nice harmony as no one flavor overpowered the others. The roe added the occasional explosion of sweet brine while the custard provided a nice creamy base with the flavor differing from bite to bite. This dish worried most of my companions who hadn't acclimated to uni yet; however, I believe this may be the catalyst that changes that. Damn no more free uni for me. 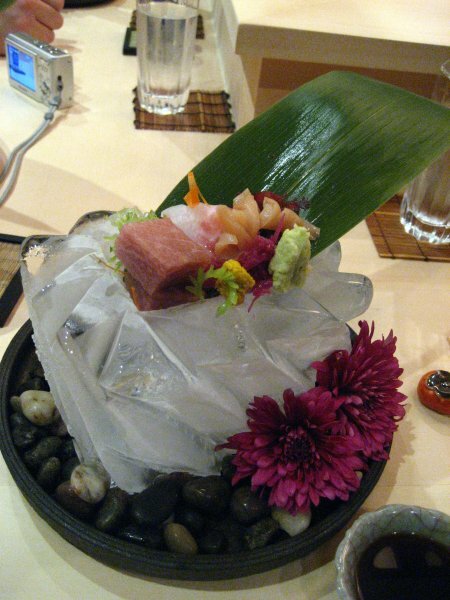 This was one of the most beautiful dishes 6 perfectly prepared pieces of seafood on a block of ice carved by Urasawa-san himself (who knew he was multitalented). Note the young apprentice in the picture. Urasawa remarked that he used to be the one standing there when Masa Takayama ran the place. Urasawa then joked his apprentice might become the master when it was his turn to go to New York. One of my companions and I actually got chastised because we reached for the dish before it was placed before us. To be fair, the process is as important as the actual eating and we were foolishly depriving ourselves of part of the luxury by being hasty. 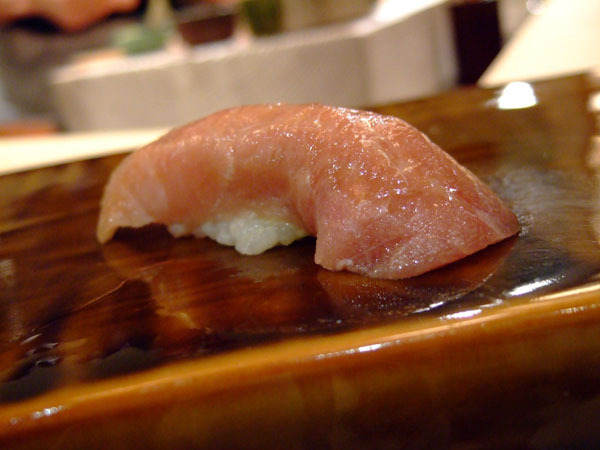 The toro was fairly iconic, minimal tendon and other undesirables while plenty of marbling and flavor. The snapper was a bit lighter in flavor and the connecting tissues holding the pieces of fish together seemed a bit looser than the norm. The orange clam had the scent of the ocean that turned my friends off to it originally, but the flavors were muted by the sweetness of the meat. 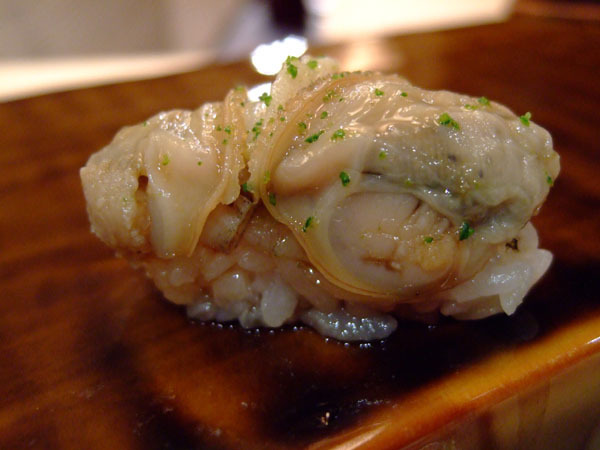 The texture of the clam was not quite crunchy but almost as if the meat resisted until a sufficient amount of force was applied whereupon it snapped cleanly. For me this was the weakest dish of the evening. Certainly a very pretty dish though. 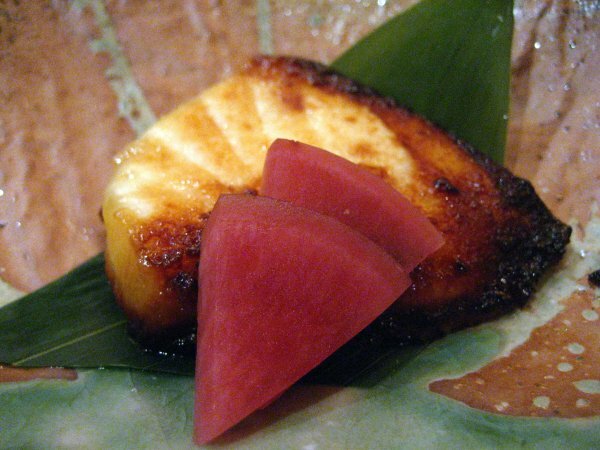 The turnip was almost like a thick jelly in texture while it had only a mild turnip flavor. I expected the chrysanthemum syrup to have a stronger flavor but it just had a very slight flavor reminiscent of chrysanthemum tea served at Chinese restaurants. The shrimp paste had a texture akin to a fish ball and provided most of the flavor. Even then I found myself constantly looking for a bit more taste from the shrimp and being thwarted despite my best attempts. Oh WOW! 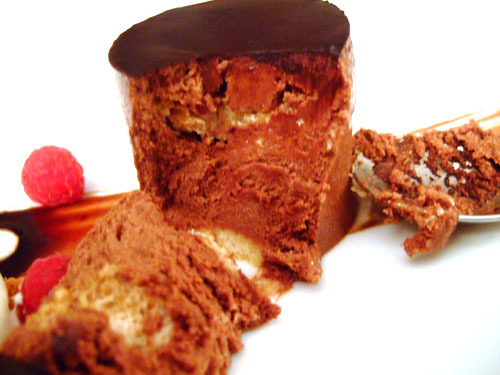 Melt-in-your-mouth seems too clichéd to do this course justice. 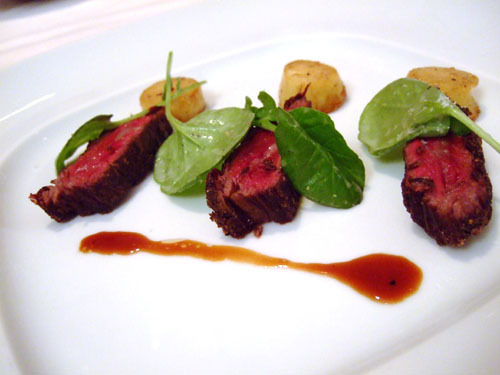 Saga beef is a highly marbled beef that ranks up with Kobe beef in terms of quality. The flavor is delicious similar to Chinese braised beef but richer and more complex. I found it interesting this dish seemed like it had been cooked thoroughly for an extended period. That flies in the face of conventional wisdom of serving beef with high marbling content which says sear and serve lest the marbling melt and run. 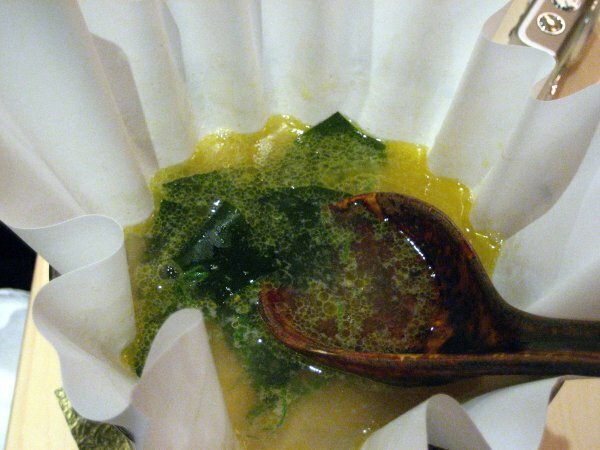 I imagine this was simmered on low heat letting the flavors seep in at the same time the fat has semi melted but not run off and the connecting tissues have been softened. As a result of this the muscle fibers are barely connected and break on contact with the slightest pressure. The sea bass is firmer than I expected. I expected something more akin to Chilean sea bass soft and fatty. The miso flavor was almost ethereal and I found myself tasting the dish carefully trying to be sure the miso flavor was actually there and not just something I imagined. Having seen the radish overpower a brilliant dish earlier I was a bit hesitant to try the radishes that came with this dish. I was pleasantly surprised to find them sweet and crisp a wonderful accompaniment to the heavier fish. Every review of Urasawa I have read includes some form of Shabu-Shabu and we expected no less. There was a slight intermission at this point as Urasawa-San brought out a live lobster and proceeded to prepare it in front of us. In short order he had 10 pieces of lobster tail to go along with servings of Kobe beef and foie gras. 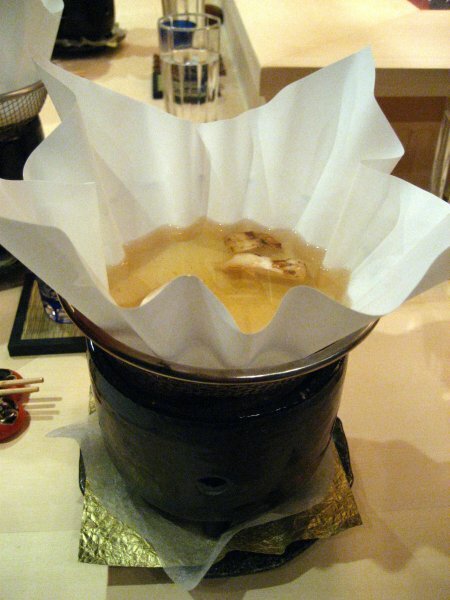 The shabu-shabu stock was a mushroom broth that had a wonderfully savory flavor. The hostess came out and gave us some brief instructions on how to prepare the delicacies. The lobster tail had a crunch to it that almost screamed freshness as it should it was alive not 5 minutes before. The lobster was reminiscent of lobster eaten at other restaurants but the texture was slightly crisper and the flavor a touch sweeter and that is what sets Urasawa apart from masses. 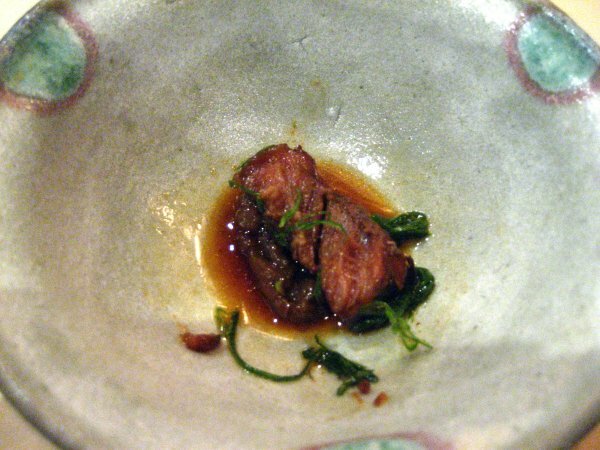 The Kobe beef had the wonderfully fatty flavor that it is renowned for and my mouth clamored for more after finishing them. The biggest surprise was the foie gras, normally nobody in my dining party aside from me touches the stuff and I do it only reluctantly. This one dish changed that for everybody. Hands down the overwhelming favorite, the lightly cooked foie gras seemed to absorb some of the stock leaving it slightly swollen and very soft. Upon chewing it fairly explodes in the mouth with a sweet rich unctuousness that settles like a blanket across the tongue, with none of the heaviness or gaminess one might expect from the dish. And not wanting to waste a thing we quickly quaffed the mushroom stock, which had since been infused with oil from the foie gras and Kobe beef. That concludes the kaiseki part of the meal and we switched gears beverage-wise as well. 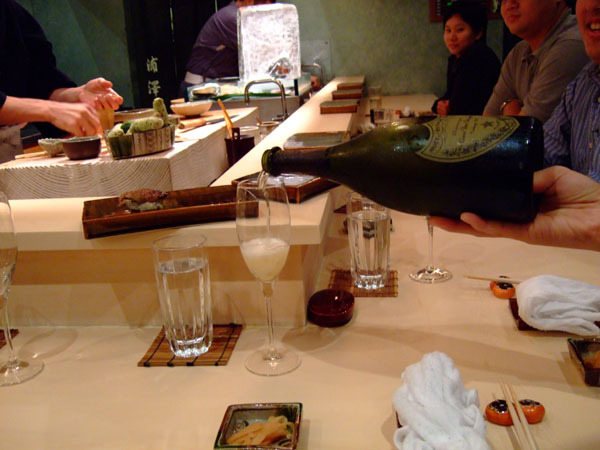 At the last major sushi meal my group enjoyed we brought a bottle of Cristal. This time we went with a bottle of 1993 Dom Perignon. This may be the finest champagne I have had in my life. I am partial to sweeter sparkling champagnes demi-sec the like. This was a brut that had some flavors reminiscent of the 1998 but overall a far more complex vintage, with a taste of minerals as well as hints of piquant sweetness and a nose like that of a fine Sauternes. Up to this point my friend and I had been incessantly taking pictures and constantly asking questions to Urasawa-San. He took it all in stride answering our questions with aplomb and asking if we were writing for Chowhound. 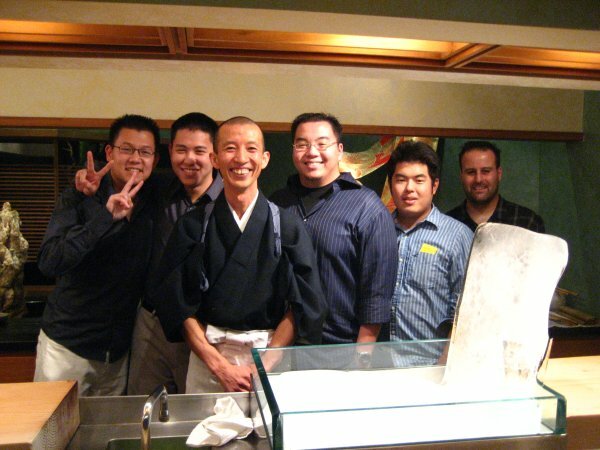 Unlike most places, Urasawa made each piece of sushi and served us one after another rather than making all five and serving us simultaneously. In fact, when he started making the sushi he warned us "use hands" and "eat within 10 seconds for optimum flavor." While this was spoken lightly and with a smile I sensed the serious undertone in his voice and expression. He truly believed if we tarried too long taking pictures we would miss out. I wonder if there isn’t the obsession with quality of a master craftsman in there as well. 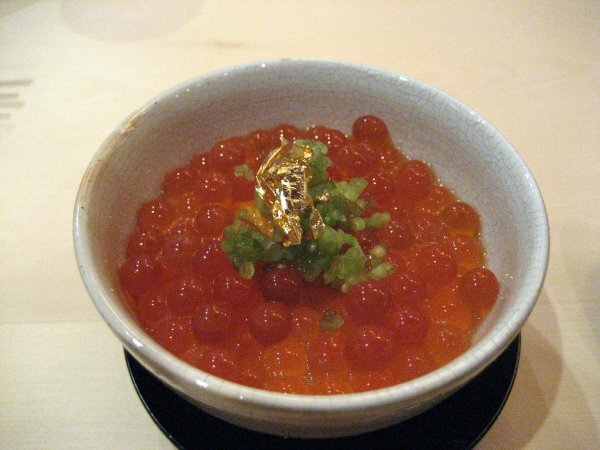 In fact for the ikura he specified to eat immediately and seemed truly dismayed my companion didn't. He looked to me and said sternly no more pictures and that I should use the ones already taken. Naturally, I trusted his advice and happily acquiesced. Does this redefine toro? Yes it does. Urasawa-san doesn’t do anything different, he just does it better! This was almost marbled enough to be confused with toro. 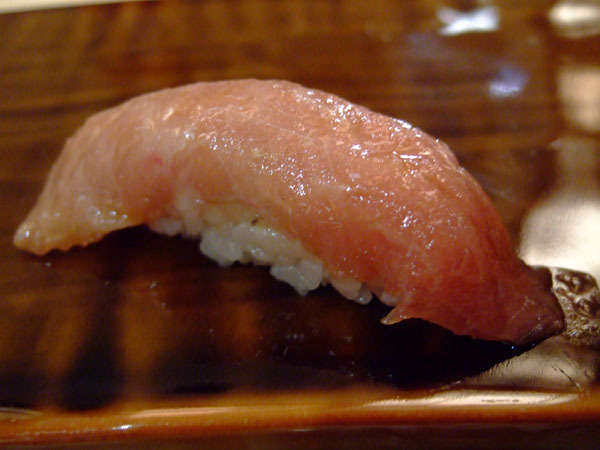 The texture was softer than normal maguro, but the fish had a distinct flavor I couldn’t quite identify. The cooking softens the tendons and melts the fat creating an almost gummy texture. The fish also had a wonderfully charred BBQ taste. This was my first experience with raw. 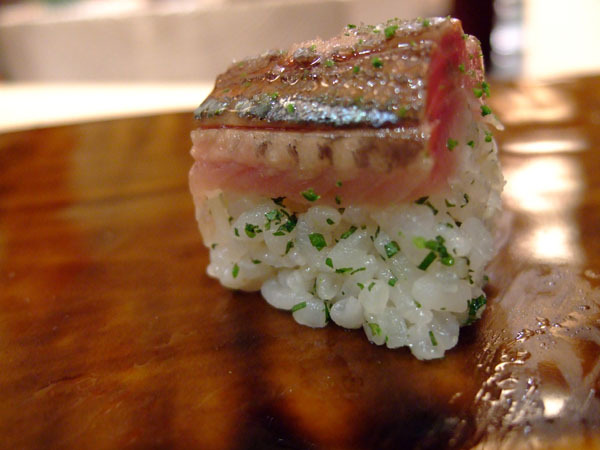 I think this has more to do with naming confusion than inexperience as I have heard both sawara and aji referred to as Spanish mackerel. At any rate, I thought the sushi had a lighter oiliness than what I am used to. This was slightly different from the sashimi. 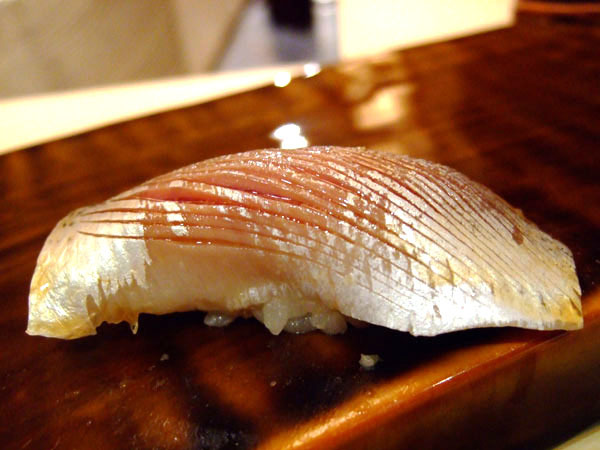 The nigiri was topped with yuzu zest and a light soy or ponzu that gave it a bit of saltiness as well as a refreshing flavor. 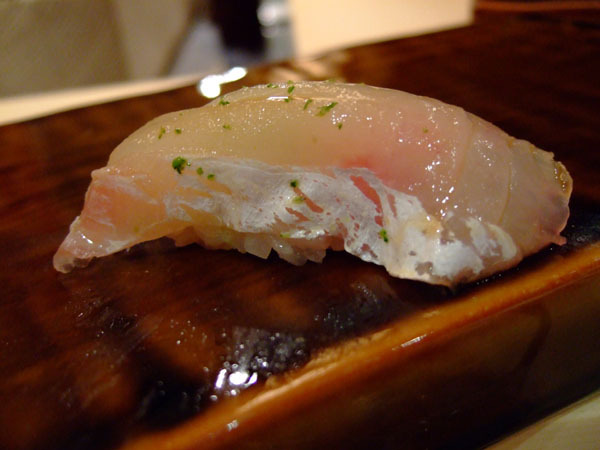 However I preferred the texture of the earlier snapper sashimi. I swear I had this in Tokyo. This was a thin fish with a deep red color and almost a cherry-like flavor. These are small white shrimp rather than the single large amaebi. The shrimp have a much softer texture and turned almost creamy upon mastication, something I have only experienced with ika previously. All things considered I prefer the taste and texture of simple sweet shrimp. I love the color pale white flesh with a strip of vibrant red. If not for the skin I could mistake this for snapper easily. However all that changes once you pop this in your mouth. This is quintessential mackerel, oily and fishy. 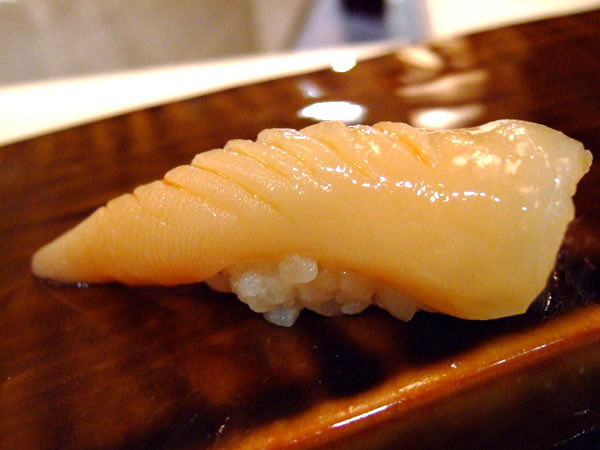 A very unique looking nigiri. Mostly white flesh with a single accenting stripe. The texture is crisp but firm and the flavor is quite mild with just a hint of fishiness and not in an unpleasant sense either. I would love to have this again somewhere but I get the feeling it isn't widely available at your local sushi joint. When he handed us this one I was a touch surprised. 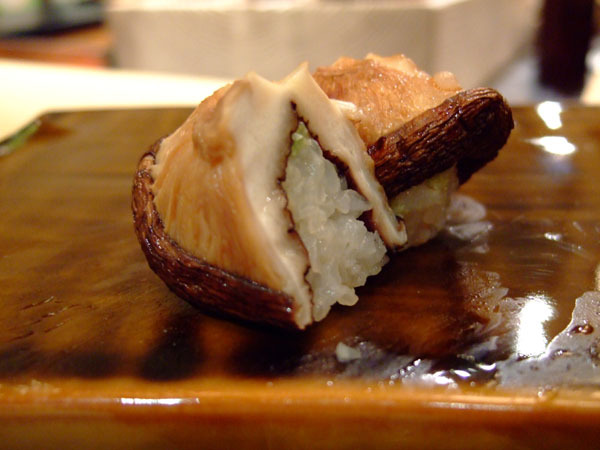 I love shitake mushrooms but I never expected to be served one as a piece of sushi. However the crisp fresh shitake paired very well with the wasabi. Again the light cuts with the knife. 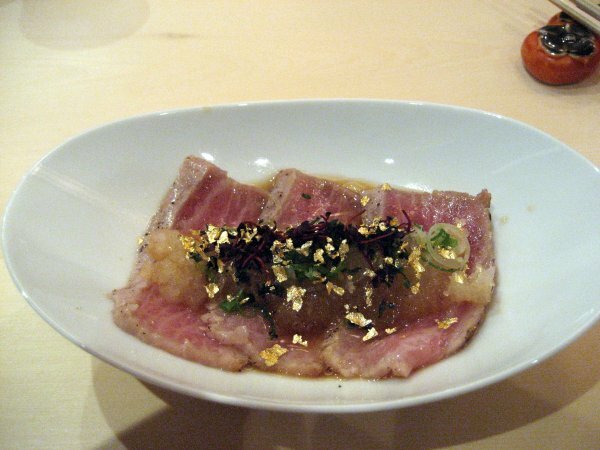 I liked Kohada from the first time I tried it and this was no exception. One thing of interest is that many of the fishes served here look totally raw. Perhaps the milder flavors have to do with the fact that the fish isn’t soaked. 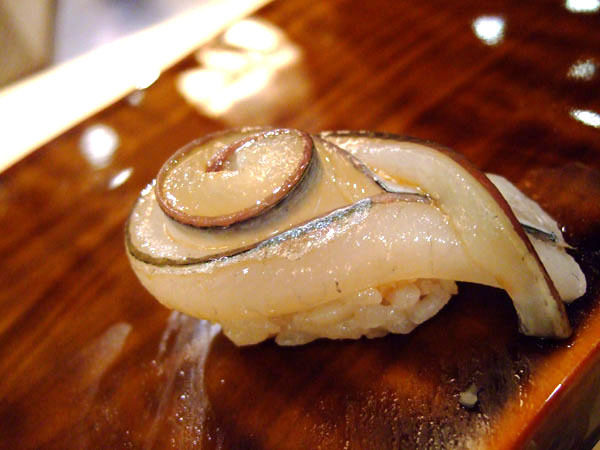 Normally the kohada I eat is seasoned with salt and soaked overnight. 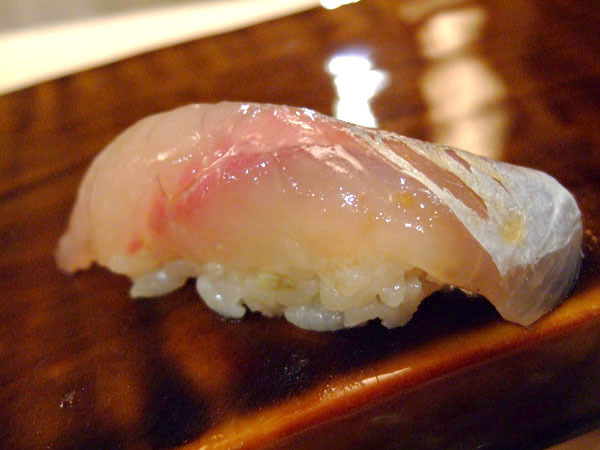 Like with the Spanish mackerel this was served totally raw. The unique preparation is one of the bits of attention to detail and uniqueness you get at Urasawa. One has to handle a knife in the kitchen to truly appreciate the difficulty of the fine cuts made by Chef Hiro. I watched, as he deftly seemed to brush the knife over the surface of the abalone to make the slight cuts. 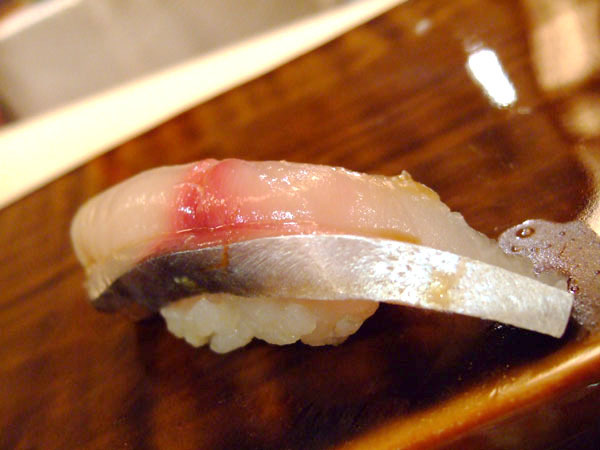 I have always wondered why they do that for certain fish like Kohada, Ika, and Abalone. Grilled and lightly flavored with sweet sauce. 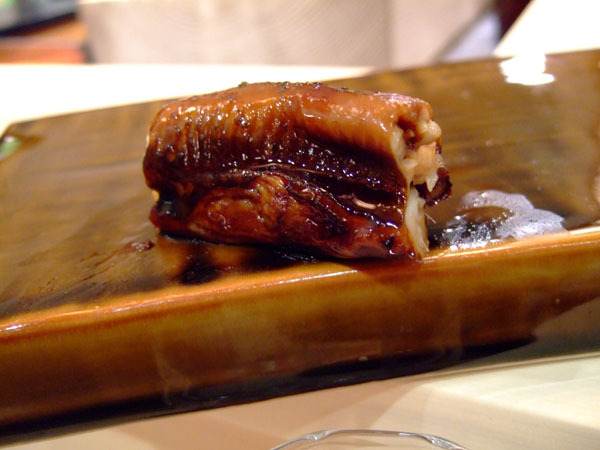 Although I enjoyed this, I have always preferred the meatier texture of freshwater eel to saltwater eel. This marks the end of the official dinner service. However this is not your normal restaurant and rather than just move onto dessert, the chef asks if we are full. Now I was sated, but I thought to myself how often can I eat this well and looking around I saw similar feelings on the faces of my dining companions. So we smiled widely and asked for more. Being the gracious host he was Urasawa-san asked what we liked best and we joyously responded "TORO!" More of the same, which isn’t a bad thing. Urasawa-san apologetically noted this is the last of the toro for the night. Looking back at the notes, we recorded this fish was somewhat soft and sort of middle of the road for flavor. I think we were just getting tired of analyzing by this point. But wait there’s more. Seeing how much we loved toro, but being unable to serve everyone another piece of nigiri, Urasawa san served us a toro roll. I remember this having real crunch and having a flavor like spring rain from the scallion. This was the perfect sushi to give us a second wind and restore our energy levels that had no doubt waned over the course of a 4-hour meal. This was the dish we were asked to eat immediately "no pictures". And it was divine. 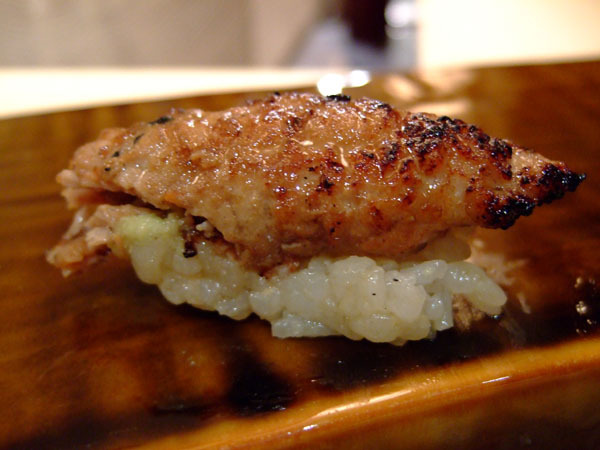 The cold salty explosions serve as a wonderful counterpoint to the warm rice. 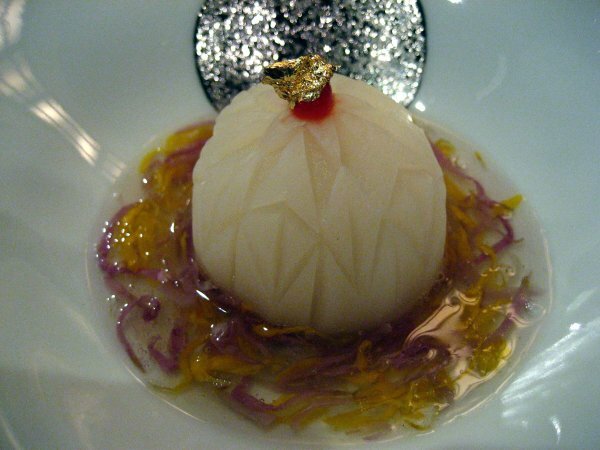 The yuzu zest not only made gave a wonderful visual contrast to the perfect spheres of exploding flavor but imparted a unique twist to the morsel. At this point Urasawa-san again asked if we had enough. This time we hesitated. Were we satiated? Certainly. Would we eagerly stuff ourselves further? Without a moments hesitation. Finally good manners won out and we politely but reluctantly declined further servings of sushi. 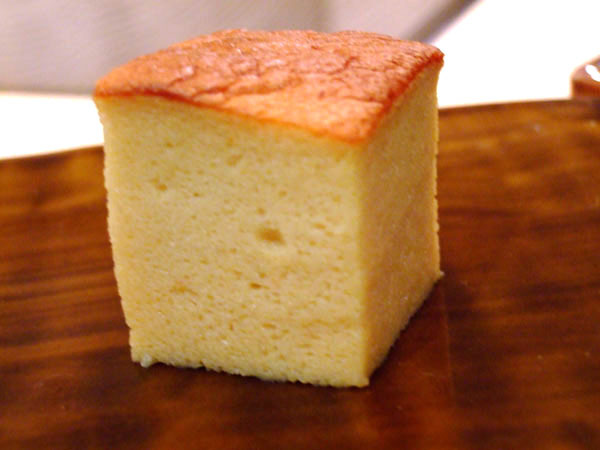 This looked like a piece of pound cake so I was surprised to find this was actually tamago nigiri. I never order this from sushi restaurants. After all the exotic fish to offer us egg seemed a touch odd. 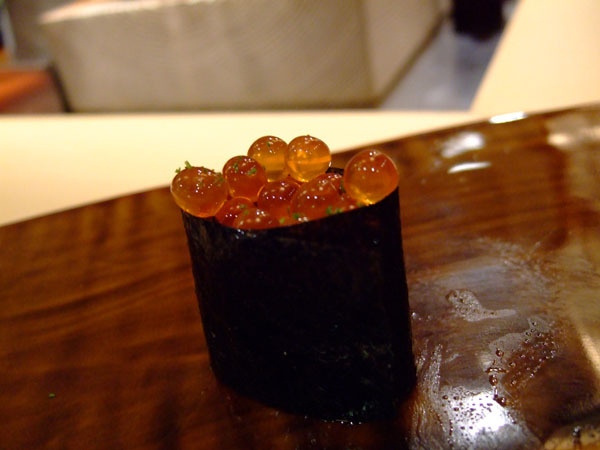 Perhaps seeing our confusion Urasawa-san gently explained a sushi restaurant's quality can be judged by its tamago. If so than Urasawa is truly brilliant. The tamago was airy and delicate with a light sweetness. 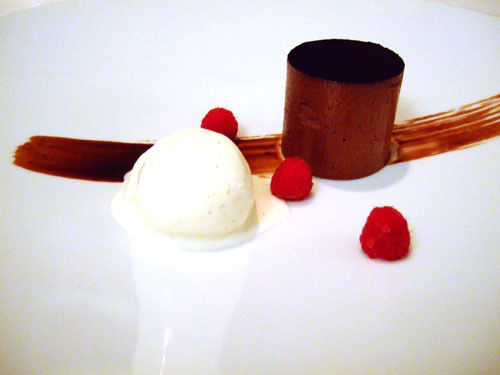 This dish served as the perfect close to the sushi and the beginning of the desserts. 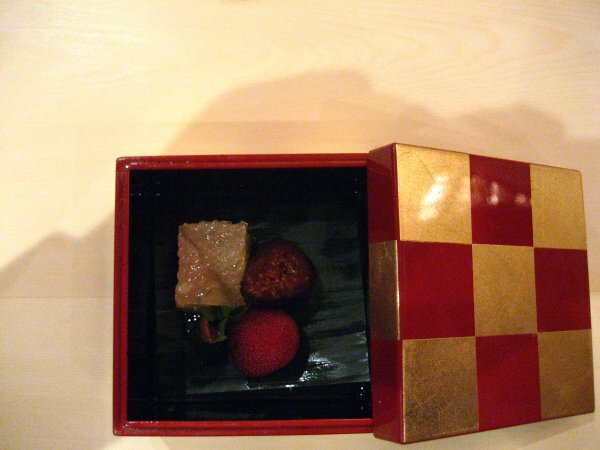 Served in a little red and gold-checkered box this was the first official dessert. Each fruit was sweet in its own way. I liked the mountain pear the most (the little red spiny ball). I tend to shy away from shiso-flavored dishes because I find the taste of shiso a bit too strong. The grapefruit jello was good but having recently come back from Japan I had one there that was far better, which dulled this one's luster. The essence of sesame distilled into ice cream form. Foamy warm green tea. 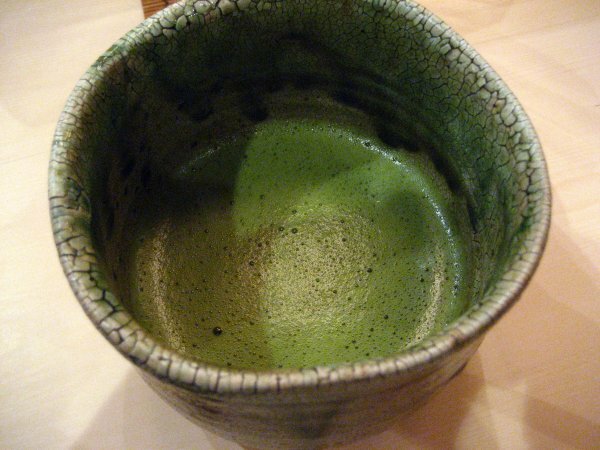 Reminds me of the macha I had in Japan. I like the lightly bitter and creamy combination. And if one tea service isn’t enough for you here is another. 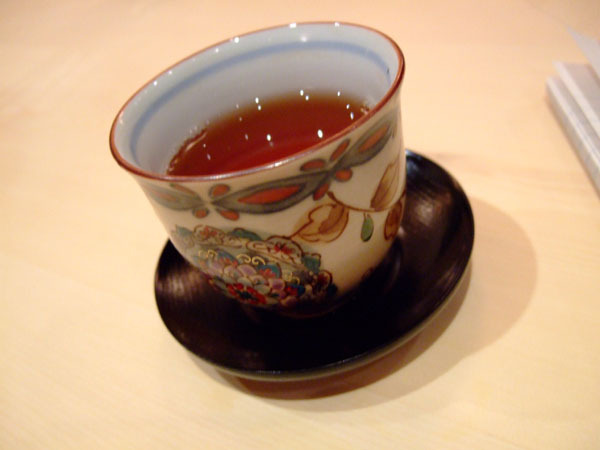 This almost looked like a tea served in a Chinese restaurant. The roasting brought out a stronger bitterness but after having one tea the added bitterness was fairly welcome. 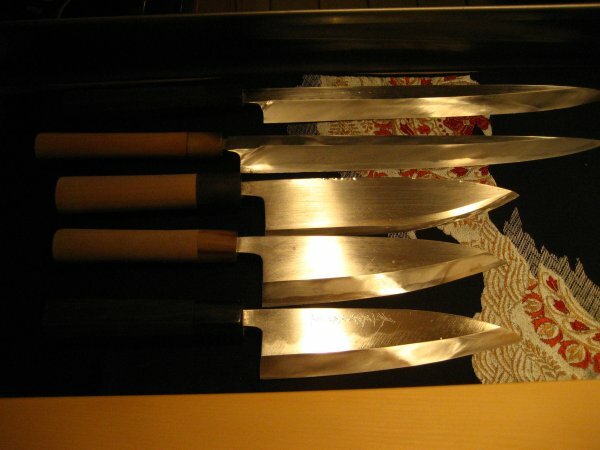 These aren’t your normal kitchen knives. I didn't pay enough attention to which knife he used when, but I am sure each has its uses. 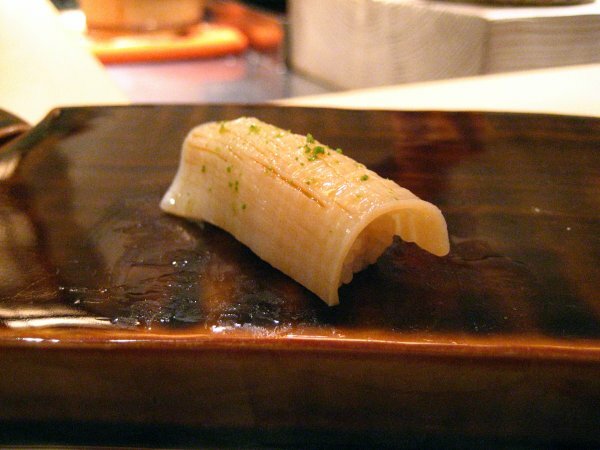 Additionally, Hiro used to serve Fugu and supposedly had a $2000 knife specifically for that one purpose. 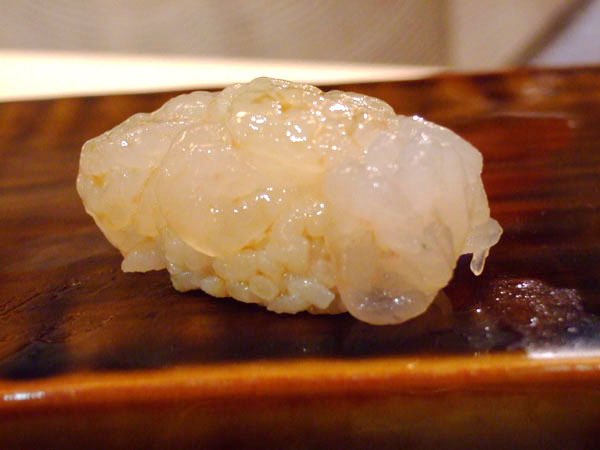 Sadly, fugu is no longer on the menu at Urasawa, after being fined by the government a number of times; he has given up serving the delicious yet highly poisonous (if incorrectly prepared) fish. A couple final notes, dining here is strictly by reservation only (two walk-ins were turned away by a polite and firm Urasawa-san. This is for a number of reasons, there are only 10 seats at the bar and a table for 4, the restaurant is not equipped to handle a large crowd, and in my estimation the quality of the meal would suffer tremendously. The second reason is with a meal of this caliber, the ingredients must be fresh, and in fact one of my companions told me that Chef Urasawa buys his ingredients fresh that morning. Also prepare to have lots of time (~4 hrs) although one hardly notices the passage of time and for me the meal passed all too quickly. Finally a warning on the price, it is $250 per person pre tax and tip and for those who treasure the unique dining experience Urasawa offers this is a bargain compared to others, Masa and Kyubei come to mind. However, for many the sticker shock on such a meal can outweigh the pleasure and that is a tragedy for the diner, the chef, and the potential foodie who could have truly appreciated the pleasure. The dining party poses for a final shot with Urasawa-san. Thanks to Kevin for the use of some of his pictures.